In my last post, “It seems the sky is falling…”, I talked about the Russian meteor event and flyby of asteroid 2012 DA14, both of which occurred on Friday, February 15, 2013. In that post I talked a lot about the various terms of things in space that can enter the Earth’s atmosphere and ultimately cause an “impact”. But there are a lot of terms and some of them have very minute differences, so I figured I’d devote a post just to explaining these terms. Specifically, I’d like to look at a few differences. These words all share the same root, the Greek word meteōros, meaning “suspended in the air”, and look very similar, but they do mean different things. To start off, let’s think of a small piece of rock in space. We don’t care what kind of rock it is or where it comes from, let’s just call it a small rock. Now, let’s say that small rock is happily zipping around the solar system, obeying the law of gravity as it orbits the Sun, when suddenly it gets too close to Earth and the gravitational pull of the planet sends tugs it out of its original orbit and towards our planet. Now, that small piece of rock that’s on it’s way into the Earth’s atmosphere, that’s a “meteoroid”. Once that “meteoroid” hits the Earth’s atmosphere travelling at high speed it’s going to heat up and leave a trail in the sky. That heating up and the resulting streak in the sky is a “meteor”- commonly referred as a “shooting star”. If you get a whole bunch of associated “meteoroids”, say a whole bunch of little pieces of rock left over from an asteroid or comet that passed by, that enter the atmosphere at the same time, creating meteors, that’s called a “meteor shower”. So, the “meteoroid” is the small rock that causes streak of light and the “meteor” is the actual visible streak we see. Now as that “meteoroid” is hurtling through the atmosphere and heating up, it can literally blow up. 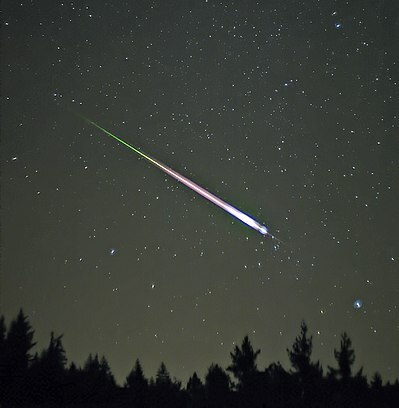 That huge flash that’s caused by the disintegration of the “meteoroid” is known as a “fireball” and really bright “fireballs” are known as “bolides”. That huge flash of light is usually associated with a large deposit of energy into the atmosphere that causes a pressure wave like to ones seen in Tunguska and Chelyabinsk. The solar system is full of little pieces of debris moving really fast and without the atmosphere that debris would constantly be pummeling the surface of the planet…and us. So the atmosphere protects us. Things are constantly entering the atmosphere and burning up, creating “meteors”. Most of these “meteoroids” are about the size of a pebble- much to small to reach the Earth’s surface. But it does happen occasionally. When large objects enter the atmosphere and make it down to Earth, that remaining piece of rock that reaches the ground is known as a “meteorite”. So yeah, if you’re one your way to work in the morning and see that there’s a huge piece of rock sitting on your car, that’s probably a “meteorite”…or there’s someone who really doesn’t like you. Don’t worry though, as Bad Astronomer Phil Plait writes, only one person has ever been hit by a meteorite and that occurred in Alabama in 1954. Now, not all “meteors” and “meteorites” are caused by natural objects in space. Think about all of the satellites and “space junk” orbiting the Earth. If any of that space junk were to re-enter the atmosphere it would burn up, just like a space rock, and cause a meteor. And another, less appealing example is astronaut waste. On the now-retired Space Shuttles, the urine was expelled out into the upper atmosphere to burn up/evaporate– this actually created a visible glow. Solid waste on the Space Shuttles was collected and removed once the Shuttle returned to the ground, unfortunately that’s not really an option on the International Space Station (ISS), where astronaut waste is stored, then loaded into a disposable space probe and ejected out to burn up in the atmosphere. So yeah, next time you wish on a shooting star, just think that it might actually be astronaut poop. Most asteroids are actually leftover bits and pieces of planets that weren’t able to coalesce under gravity. 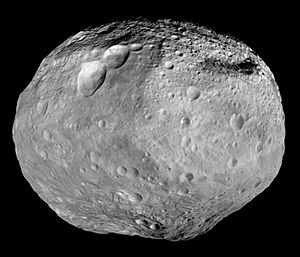 As the NASA page describes, most asteroids live in the Asteroid Belt that orbits between Mars and Jupiter. However, as those asteroids travel around the Sun, they can bump into each other, causing a rogue asteroid to leave the Asteroid Belt and traverse the solar system. Sometimes those asteroids fall into the Sun, sometimes they collide with Earth or other planets. So what’s the difference between an asteroid and a comet? A “comet” is an icy body that lives out in the farthest regions of the solar system. There is belief by scientists that many comets primarily live in a region at the edge of the solar system known as the Oort Cloud. As these icy bodies come into the inner solar system and approach the Sun, they increase in brightness as the heat from the Sun causes the ice to melt and reflect sunlight. Comets are generally much easier to view than asteroids due to the high reflectivity of the water vapor it releases as they travel through the inner solar system. Generally comets that pass by the orbit of the Earth leave a debris trail in their wake. When the Earth’s orbit takes it through one of those debris trails, it causes a meteor shower. So comets are mostly icy bodies that live out at the very edge of the solar system and asteroids are rocky, metallic bodies that generally live in the Asteroid Belt in the region between Mars and Jupiter. Imagine driving in your car on a lovely Friday morning and seeing a flaming ball of death streaking across the sky and coming, as best you can tell, right at you. That’s what terrified citizens in the lovely Russian city of Chelyabinsk experienced on the morning of Friday, February 15. The multitude of videos and photos of this meteor are simply horrifying since many of them give the impression that this huge chunk of flaming interplanetary death is about to smash right into the camera. Not only did this fireball make a scary visual impression, but it packed a very literal punch as well. As the meteoroid hurtled through the atmosphere at 40,000 mph, the heat and pressure it felt caused it to break apart with a huge amount of energy, the equivalent of 470 kilotons of TNT (or 30-40 times the power of the atomic bomb dropped on Hiroshima). The deposition of that huge amount of energy into the sky caused a pressure wave that blasted the city. Over 1,000 people were injured by the blast, mostly due to cuts and scrapes from glass as windows shattered. Scientists have now come to the conclusion that the initial object was only 17 meters wide– that’s about the size of a tractor trailer. That’s pretty small cosmically speaking. Imagine the damage that could have been inflicted if something larger had hit the atmosphere. The last time a meteor had significant large-scale impact was in 1908, again in Russia. This impact, known as the “Tunguska event“, is the largest impact ever recorded- 20-30 times larger than the one that happened this month. This meteoroid, which is estimated to have been about 100 meters wide (the size of a football field), blew up in the air and released 10-15 megatons of energy, leveling 830 square miles of trees. Witnesses to the event said that the heat and pressure from the explosion made their skin feel like it was on fire. Luckily the 2013 Russian meteor was much smaller, so windows got knocked out but buildings weren’t leveled. The object was actually so small that astronomers didn’t even see it coming. NASA has a whole division of people who track objects that could potentially come close to Earth, it’s known as the Near-Earth Object Program. Unfortunately, for scientists to be able to see an object it needs to be large enough to reflect an observable amount of light. That didn’t happen here. The meteor also came as a bit of a shock since scientists were so focused on another Near-Earth Object called 2012 DA14. This 45-meter wide asteroid was scheduled for a flyby of Earth on the same day, February 15. 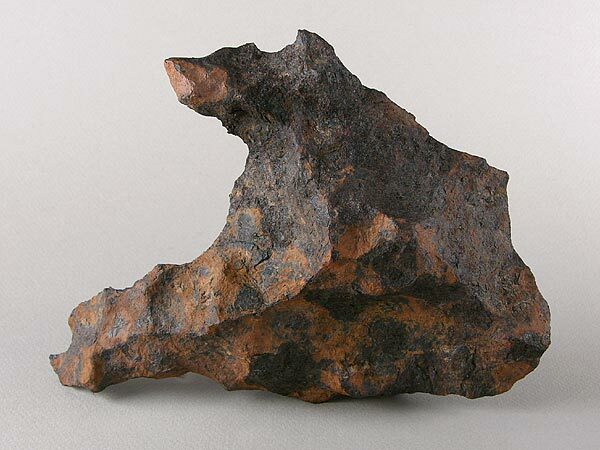 This relatively small piece of space rock flew closer to the Earth than any other celestial body. It was 17,200 miles away at its closest approach, that’s closer than satellites in geosynchronous orbit and much, much closer than the Moon. Although scientists were certain that DA14 wouldn’t impact the Earth, they were very excited to use the close flyby as an opportunity to study the asteroid. Of course it was ironic that after weeks of assuring the public that there was no threat of an impact from DA14 another huge impact happened in Russia the same day. Scientists from NASA’s Meteoroid Environment Office concluded that the Russian meteor and DA14 were totally unrelated, having come from two very distinct trajectories/orbits. This means it was a huge cosmic coincidence that they just happened to occur on the same day…weird. Let’s continue our explanation of how astronomers are able to gauge the distances to celestial objects. In my first post on this topic, we talked about how radar ranging and stellar parallax are used to determine distances in the solar system. Now we’ll continue working our way up the Cosmic Distance Ladder. As we leave our local planetary neighborhood, our solar system, we can still use stellar parallax up to a point. In fact, I received an email from Scott in Placentia, CA, asking “What maximum distance an object can be reliably determined by parallax measurement using the latest technology?” As I explained to Scott in my response, it’s hard to answer that question with a single number. Ideally, stellar parallax should always work, because the stars close to us will always move at least a little bit with respect to the background stars. Unfortunately as we look at stars farther and farther away, the angle that the near-ground star moves gets smaller and smaller. As you can imagine there is going to be a point where that slight angular movement is almost imperceptible. However, technology is always improving. In 1989, the European Space Agency (ESA) launched the Hipparcos mission which was specifically designed for astrometry- determining the position and location of stars. The Hipparcos mission found the positions of nearly 100,000 stars as far away as 1,600 lightyears. Expanding on that mission’s success with new technology, another mission named Gaia is slated to launch this summer and claims to have the ability to find distances to stars tens of thousands of lightyears using stellar parallax. Some sources claim that stellar or trigonometric parallax is limited by current technology to around 1,000 parsecs or roughly 3,260 lightyears. Once we reach that upper limit for the use of stellar parallax, where we can no longer accurately measure the angular shift of the star with reference to the background stars, we have to turn other methods for determining distances. The next technique we need to rely on is called spectroscopic parallax. Now, confusingly this new type of parallax is totally different from and unrelated from actual (stellar) parallax, it just uses the word “parallax” because it’s a technique used to find distances, like parallax. (That’s not confusing at all…) Okay, so how does this spectroscopic parallax work? Well you might remember in The Cosmic Distance Ladder, part 1… I talked about an important instrument used by astronomers called a spectrometer (a.k.a. “spectrograph” or “spectroscope”). These extremely useful devices break white light up into all the colors of the rainbow- this resultant array of colored light is called a spectrum. You’ve probably seen this phenomenon before. Well spectroscopic parallax, as the name implies, is all based on being able to take a good spectrum of a star. This is what sets the upper limit on the maximum distance of objects that we can determine using this technique; with current technology, spectroscopic parallax is limited to roughly 10,000 parsecs (1 parsec = 3.26 lightyears = 19.2 trillion miles). For distances where both spectroscopic and stellar (trigonometric) parallax can work, we generally use stellar parallax because it’s more precise- you’ll see why in a bit. You might also remember in my recent post about stellar classification, that I explained how each stellar class has a spectrum that is unique to that class.So that means that if you look at a nearby B-type star and a far away B-type star, they should have the spectra that are nearly identical. The difference between the two measured spectra will be their intensity, which correlates to the brightness or luminosity of a star. But now we have to be careful because there are two types of brightness: apparent magnitude and absolute magnitude. Absolute magnitude is how bright an object actually, intrinsically is, while apparent magnitude is how bright it appears to be at Earth if you ignore the atmosphere. So basically absolute magnitude is how bright an object would be if you were at it and apparent magnitude takes into account how far away you might be from the object. Think about a lightbulb: absolute magnitude would be the physical amount of light that the bulb puts out and apparent magnitude is the amount of light you measure from the bulb when you stand on the opposite side of the room. As you can imagine, the bulb will appear less bright the farther away from it you are. Same with stars. Now, once you’ve measured the apparent magnitude (using some sort of light collecting device) to see how bright the star appears to be, you have to figure out the absolute magnitude. 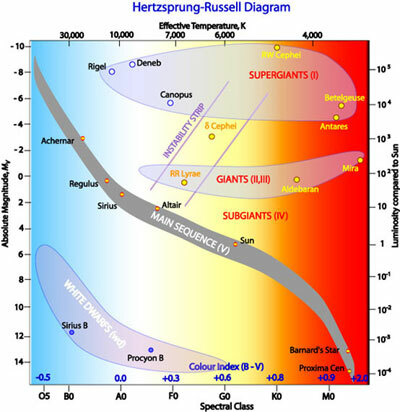 This can be a little tricky and involve some guesswork, but the main tool we use is the Hertzsprung-Russell diagram. As you can see, when you plot the H-R diagram, you can easily determine a range of absolute magnitudes that apply to each spectral class. Unfortunately that means there isn’t one right answer, so you can’t get an exact distance for the star…but you can get a pretty good range. Once you determine an appropriate value of absolute magnitude (M), you need to use some math and a mathematical formula known as the distance modulus. Now that we have the apparent magnitude (m), which we measured, and the absolute magnitude (M), which we inferred from the H-R diagram because we know the star’s spectral type, we can now use both to get the distance modulus: m – M. You might ask, “How does that help?” Well if you think about it, the difference between the absolute brightness and apparent brightness of a star is determined by distance; naturally then there is a mathematical relation that proves that. And calculating that gives us the distance to the star, d. Now granted, we might need to do that for a high and low value of M, based on how we read the H-R diagram, meaning we’d get a range of distances and not a single answer, but it still gives us a much better idea than we had about these far away stars. This is why we’d choose trigonometric parallax over spectroscopic parallax for distances where both can work, but for distances beyond the reach of stellar parallax, then spectroscopic parallax is better than nothing! Somewhere “between A and B lightyears away” is much better than “really far”! Ever wonder what makes stars different from one another? Lots of factors can come into play: size, composition, temperature, and age to name a few. Thankfully many stars are similar and can be grouped together by similarities. So here let’s talk about the history and science of stellar classification. A solid (or liquid or gas under high pressure) will give off a continuous spectrum. A gas under low pressure (i.e. most gases we know of) will produce bright, discrete lines known as an emission spectrum. If you look at a source of a continuous spectrum from behind a source of an emission spectrum, you will see what looks like a continuous spectrum with black lines missing from it; think of if you took the emission spectrum and subtracted it from the continuous spectrum. This is called an absorption spectrum. 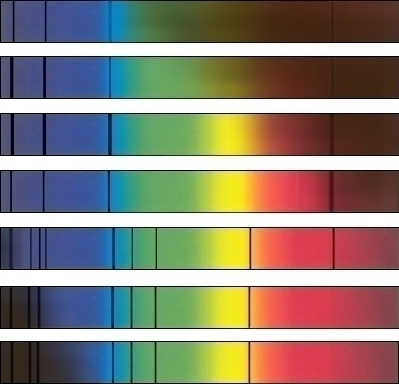 Kirchhoff asserted that the wavelength or location of these emission or absorption lines was determined by what atoms or molecules were present in the source. This is true because each element or molecule has a unique atomic spectrum or signature. At the time that Kirchhoff came up with these laws scientists had yet to crack the secret of the internal structure of the atom. Meaning Kirchhoff made these laws based on purely on experimentation. It took another half a century for Niels Bohr to come up with a correct model of the atom that concluded the existence of discrete energy levels that successfully explained Kirchhoff’s emission and absorption lines (and later led to the formulation of quantum mechanics). So back towards the end of the 19th century, a man by the name of Edward Pickering was the director of the Harvard College Observatory. Mr. Pickering decided to take it amongst himself to obtain spectra of as many stars as he could and then index and classify them. So Pickering did what any good scientist would do, he began to collect data. But as you well know, there are a lot of stars in the sky, so before he knew it he was inundated with tons of photographic plates (if you thought film was bad, its predecessor was worse- these plates were usually large heavy pieces of glass mixed with silver salts) containing stellar spectra. Legend has it that Pickering was getting so aggravated by the incompetence of his male research assistants that he exclaimed that his maid could do a better job. So he hired her. Her name was Williamina Fleming and along with Pickering she helped to publish the Draper Catalogue of Stellar Spectra (named in honor of Henry Draper, the first man to take the spectrum of a star on a photographic plate), which had classifications for 10,351 different stars. Once Fleming left Pickering’s service, he hired several other women assistants. 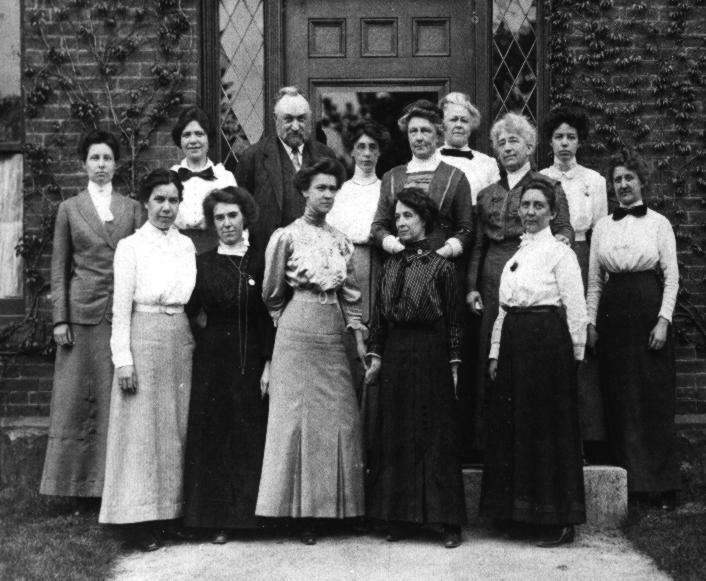 Out of this group of women, which became known officially as the “Harvard Computers”, but commonly as “Pickering’s Harem”, came some of the greatest early female astronomers, including Annie Jump Cannon, Henrietta Swan Leavitt, and Antonia Maury. The initial version of this catalog, published from 1918 to 1924 in 9 volumes, included the positions, magnitudes, and spectral classifications of over 225,000 stars. Alright, so how does that help astronomers? Well, in essence a star is a gas under high pressure, meaning it should give off a continuous spectrum according to Kirchhoff’s first law. But the outer layers of a star’s “atmosphere”, called the corona, is a gas under low pressure- meaning we actually see an absorption spectrum (Law 3). (In fact, it was the unexpected discovery of this absorption spectrum that helped us to realize that our Sun had an “atmosphere” or outer layer of hot gas surrounding it.) Since stars of the same size and mass are made up of pretty much the same stuff, they have similar spectra. In fact, this is how astronomers classify stars, by their spectral class. The different stellar spectral classes are O, B, A, F, G, K, and M. Type O stars are the hottest and Type M stars are the coolest. Each spectral class or spectral type has a unique spectrum. Now, like a lot of things in astronomy, this naming scheme is totally absurd and illogical. I wish I had a better explanation for why we have this naming scheme, but basically it’s a historical holdout from back when astronomers started classifying stars without really understanding them. Remember the Harem? Well in the first publication of the catalog in 1890, Williamina Fleming did most of the classification. She used a classification system that had been developed a few decades earlier by the Italian astronomer Angelo Secchi. Since she had so many stars, she took Secchi’s five classes and stretched them out to encompass fourteen classes from A to N. Then she added three more categories (O, P, Q) to encompass stars that would not have fit Secchi’s scheme. A through Q made sense. But then in 1897, Antonia Maury was working on a different set of stars and decided to reclassify what Fleming had done. So she scrapped the letters and made 22 classes from I to XXII…still made sense. Unfortunately, in her rearranging of Fleming’s classes, she wasn’t paying attention to the letters and moved some around, hence O and B moving towards the front. Finally in 1901, Annie Jump Cannon (probably the most famous and accomplished of the Harem) was cataloging and decided to go back to the letter system and dropped all the letters except O, B, A, F, G, K, and M in that order. Why? I have no idea. For some reason after Ms. Jump Cannon came up with her system they had had enough reclassification and no one suggested, “Hey maybe we should have these make some kind of logical sense.” Astronomers can be infuriating sometimes. 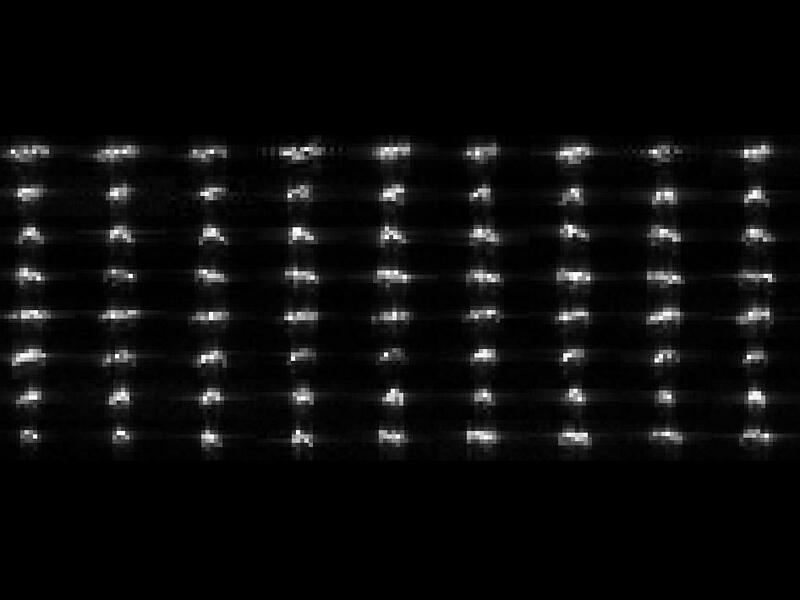 The final crazy product is known today as the Harvard Spectral Classification. So, if you need a way to try to remember Ms. Jump Cannon’s crazy archaic classes, try “Oh Be A Fine Gal (or Guy), Kiss Me!” Of course, the cockamamie lettering system wasn’t enough, Ms. Jump Cannon then needed to add ten subclasses from 0 to 9 for each letter. Meaning not only is a B-type star hotter than a K-type star, but a B1 star is hotter than a B5. Our star, the Sun, is a G2, meaning it’s pretty much right in the middle of the stellar pack. But somehow the crazy letter and number combination still wasn’t quite exact enough. In 1943, three astronomers from the Yerkes Observatory in Wisconsin came up with another classification system that focused not only on the surface temperature of a star (which the Harvard Classification does), but also on the luminosity (or brightness). Basically, you can have a really big red giant star and a teeny tiny white dwarf star that are the same temperature and therefore have similar emission lines. However, you can look at how sharp those emission lines are and determine the surface gravity or pressure that that star must have. When introducing this new factor into the equation, the Yerkes astronomers came up with seven (I-VII) new classes that basically help to dictate what stage of life a star is in. 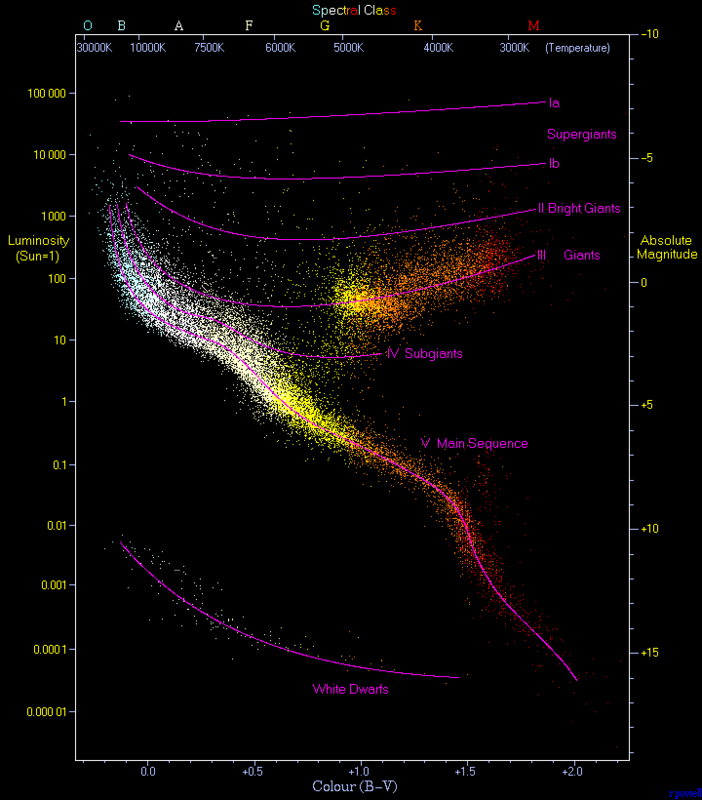 To try to help this make some visual sense, astronomers have developed a graph called the Hertzsprung-Russell diagram that correlates how bright a star is, how hot it is, and what spectral class it’s in. This pretty ingenious and very common graph helps to simplify a vast amount of knowledge. It’s really pretty obvious how the groups appear when looking at a filled out H-R diagram. Most stars, like our Sun (which is a G2V), are in class V, meaning they are still on the “Main Sequence” and are still fusing hydrogen into helium. As stars live and evolve, they move off of the main sequence and into other branches of the H-R diagram. Can you pick out where the Sun would be on this H-R diagram below? Okay, this is really getting pretty infuriating. I have friends, family, and strangers messaging me about when the planets will align tomorrow. So let’s set the record straight…or at least as much as we can by answering a few simple questions regarding this Mayan end-of-the-world who-hah and why the world will NOT end today. Where did this idea of the world ending even come from? The ancient Maya civilization (aka the Mayans), that lived in Central America from roughly 1800 BC until the Spanish wiped the last of them out around 1700 AD were great astronomers. They had their own constellations, pre-telescopic knowledge of the Orion Nebula as a fuzzy object in the sky, and some of their sites are oriented to astronomical objects such as the Pleiades star cluster. Like many advanced cultures, the Mayans used a calendar. They didn’t invent the calendar, but they used it, like most Central American civilizations previous to Columbus coming to the New World; however, they did add on to it. The Maya came up with a very different calendar from what we use. They have what we call “the Long Count”, which is made up of 13 “baktun”. Each “baktun” is comprised of 20 “katun”. Each “katun” is 20 “tun”, each “tun” is 18 “unial”, and each “unial” is 20 “kin”. What the heck does that mean? Well, we can easily make the metaphor that the Mayan “Long Cycle” is like a year in our very own modern day Gregorian calendar. Now, a “kin” to the Maya is equivalent to a modern day, so a Long Cycle is MUCH longer than a Gregorian year- it’s actually roughly 5,125 years. But here I’m using the analogy just to make a point. When you get a Gregorian calendar for your desk or wall, it usually only has a single year in it, for instance, your current calendar probably doesn’t extend into 2013. Of course that doesn’t mean that 2013 doesn’t exist, you just need a new calendar. Well, the same thing happened with the Maya, they stopped generating calendars beyond this current baktun, which would end in our modern Gregorian time at December 21, 2012 at 11:11 GMT. But like I said, this doesn’t mean the world is going to end. It’s this “reset” of the Mayan calendar that has fueled the plethora of end-of-the-world scenarios. Looking at this another way, imagine if there WAS a cataclysmic end of the world tomorrow and then far in the future an advanced civilization found what was left our world and realized that there were no calendars that existed beyond 2013…what might they conclude? Oh no, the human calendar must have ended after January 31, 2013!? We all know that’s not true, but one could imagine how an ignorant futuristic civilization might be confused. Based on this “end of the Mayan calendar”, people across the world and across the internet have tried to come up with ways and reasons that the world might end on December 21, 2012. Some of these catastrophes are minutely based on real things, many are not, and almost all of them are ridiculous. On top of that, the movie 2012 didn’t help the commotion. What is a planetary alignment and is there going to be one? A planetary alignment, or conjunction, is when planets appear to lineup in the sky from Earth and they occur fairly frequently. There are a lot of hoaxes related to the alignment of the planets and how that will impact Earth. There’s also another idea that the Earth and Sun will align with the center of the Milky Way galaxy and something cataclysmic will happen to destroy the Earth. This isn’t going to happen. Here’s an article by Francis Reddy of NASA Goddard Space Flight Center that explains why an alignment with the galactic center won’t mean the end of days. So no, don’t try to go outside and look for an alignment of planets in the sky, you won’t see anything. Now, there was some more baloney going around the internet about a planetary alignment over the pyramids at Giza on December 3, 2012. That was also a hoax… aka NOT REAL! Is a rogue planet or asteroid going to crash into the Earth? NO! Of course not! NASA has a whole division of scientists, in the Near-Earth Object Program, who work to identify and track objects that could pose potential danger to Earth. So far, they have no indication that anything will impact the Earth. There are stories of a rogue world called “Nibiru” that is supposedly going to crash into the Earth. This false claim of a rogue planet-destroyer has been warped and somehow now been misconstrued even further to include an actual dwarf planet, called Eris, that lives out in the Kuiper Belt. This planet was originally referred to as “Planet X”- another claimed possible bringer of Earth’s destruction. So recap: Eris is real, was once called Planet X, Nibiru is not real…and NONE OF THEM WILL IMPACT THE EARTH. Is the Earth’s magnetic field or a polar shift going to kill us all? Again, no. Scientists know from rocks on the floor of the oceans that the Earth’s magnetic field, which protects us from the harmful energetic particles that come streaming off the Sun, actually reverses fields. Now, generally the field of Earth does shift every 400,000 years and we’re sort of overdue for one. However, when the magnetic field does reverse (referred to as a polar shift), it won’t be instant- at least we don’t think so- and it probably won’t happen for a couple more millennia. So there you have it, no the world will not end. Yes, scientists are pretty sure- here’s an official website from NASA addressing these issues and concerns in case you’re not convinced. And finally, yes, people on the internet are crazy. So I guess all that’s left to say then is happy new Long Cycle everyone! Anyways, a lot has been going on, so this post is going to attempt to catch you up. In my last update, I was informing the world that Dr. Alex Fillipenko from UC-Berkeley was going to be speaking at the 2012 New England Fall Astronomy Festival at the UNH Observatory. Well he came and delivered his talk to a standing-room-only crowd of over 300 people. It was a great talk and he spent over an hour fielding questions from the audience afterwards. Then he came down to the Observatory and took a look through our telescope. He’s a really nice, humble, and funny guy. Dr. Alex Fillipenko and I outside the UNH Observatory at the 2012 New England Fall Astronomy Festival. Since then I’ve been busily working on research. Just yesterday I finally submitted a paper to the Journal of Geophysical Research; a paper that I’ve been working on since my rocket launch last February. The paper talks about observations that a rocket (a different one from the one we launched in February) of a phenomenon in the ionosphere (the uppermost layer of the atmosphere) called the ionospheric feedback instability. The paper gets sort of technical, but the easy explanation is that we had a model of what we thought the rocket would see, but the rocket saw something slightly different, so we came up with a new model that seems to agree better with the observations. Hopefully it will fly through the review process and be published very soon. You may remember that over the summer I chronicled my two months as an intern at NASA Goddard Space Flight Center in Maryland. Apparently, based on the work I did during that internship, I was nominated and selected to become a NASA Student Ambassador. I’m not necessarily 100% sure what being part of Cohort V (the fifth class of Student Ambassadors) entails, but they only select about 100 out of the thousands of interns that NASA has throughout the year, so I guess it’s sort of a big deal. In any case, they say I’ll get a name badge! (Always cool having your name next to the NASA logo…when you didn’t put it there yourself.) According to the welcome/acceptance letter I got, I think the position requires that I represent NASA when necessary: apparently this can include going to career/internship fairs, giving talks to students and the public, and or accompanying an astronaut to public events. I may even get to go to special NASA events, so that’s pretty awesome! So yeah, that’s what’s been going on here, be sure to keep visiting for more posts about science and NASA and all the cool things that are going on in grad school. But before I go, I’ll leave you with some pictures from the NASA booth at this year’s American Geophysical Union Fall Meeting in San Francisco. Here’s me peering through a full-scale replica of one of Curiosity’s tires. For the past few months, I’ve been spending a lot of time in my position as Manager of the UNH Observatory, in helping to prepare for the 2012 New England Fall Astronomy Festival. The event, lovingly known as NEFAF, is a family-friendly astronomy-related event that will be hosted by the UNH Physics Department in partnership with the New Hampshire Astronomical Society. As you can imagine, this is quite an undertaking, but in an incredibly exciting turn of events, we just found out that Dr. Alex Filippenko, noted astronomer from UC-Berkeley and member of the research team that won the 2011 Nobel Prize in Physics, will be giving the keynote talk at NEFAF 2012! In addition to being a highly acclaimed professor, Filippenko is also the co-author of an extremely popular astronomy textbook and a frequent contributor to the documentary series The Universe on The History Channel. Dr. Alex Filippenko, the newly announced keynote speaker for the 2012 New England Fall Astronomy Festival to be held at the UNH Observatory. That extremely exciting news has inspired me to do a couple of posts about the expansion of the universe, the area of research that Dr. Filippenko works on. But before we can really get into talking about that, we need to cover a very basic aspect of astronomy, but something that most non-astronomers don’t really know about. I was at a public session at the Observatory this weekend when a guest who had never studied astronomy before asked me what she thought might be an “ignorant” question: she wanted to know how exactly astronomers knew the distances to objects in space. This is by no means an ignorant question, in fact it’s a very fundamental and very involved question that really gets at the very nature of astronomy. Astronomy by definition is an observational science. Unlike many other scientific disciplines, astronomers can’t really do experiments in a laboratory (although some do). But the stereotypical astronomer can’t throw his subject (a star or galaxy) on a lab bench and dissect it or set up an experiment to test it, so astronomers need to observe and record data. Okay, so we observe light, that tells us what something looks like, where it is, and how bright it is. Big deal, is that really that helpful scientifically. Well, not really. So we have to come up with ways to get more information from observing the light. The main way we do that is by breaking the light up in a spectrometer, an instrument that breaks light down into a spectrum of colors. This breakdown of light can reveal an abundance of new information including what the object is made up of, how hot it is, how fast and in what direction it’s moving, how old it is, and more. The question of how astronomers calculate the distance to an astronomical object varies depending on how far away the object is. Because most of these techniques only work up to a certain distance, there is actually a progression of different approaches that astronomers use to measure distance to celestial objects. This list of methods of measuring astronomical distances is known as the Cosmic Distance Ladder (or less poetically, the extragalactic distance scale). The first step in our exploration of the universe was to our own celestial neighborhood. The first step was precise measurement of the size scale of the solar system, which started with the determination of the distance between the Earth and the Sun. As I’ve explained before, this measurement was originally calculated via observations of transits of the planet Venus across the disk of the Sun. Early on in the 20th century, observations of asteroids also played an important role in this measurement. But today the distance from the Earth to the Sun, defined as 1 Astronomical Unit or “AU”, is measured with high precision using radar ranging. By bouncing a radar beam off another planet, usually Venus, and measuring the time that beam takes to return to Earth, scientists can very accurately determine the difference in the size of the two planets’ orbits. Using that difference and the ratio of the two orbital sizes, we can very easily calculate the distance the Earth must be from the Sun. We use a similar process even closer to home. During the Apollo missions of the late 1960s-early 1970s, astronauts deployed the lunar laser ranging experiments, arrays of mirrors that allowed scientists to measure the distance to Earth’s only natural satellite with extreme precision using lasers. This radar ranging is how we’ve calculated the distance to most of the objects in our solar system. More recently, we can also use spacecraft in orbit around other planets as a tape measure by measuring the time it takes for a signal to travel from the spacecraft to its controllers on Earth. Another way we can get measure the distance to the planets and to nearby stars is a phenomenon known as stellar parallax. This method is less accurate than radar ranging for planets, but is very good for stars in our local stellar neighborhood. Parallax is something you experience almost every day. Hold your thumb up at arm’s length. Close one eye, then open that one and close the other. Notice how your thumb appears to shift with respect to the objects far off in the distance? That’s parallax! Astronomers take measurements of a planet or star a two points in Earth’s orbit (6 months apart) and measure the angular shift of an object with respect to the background stars between those two measurements. Then, because we know the distance the Earth is from the Sun, we can use some basic geometry to calculate the distance to that star or planet in the foreground. It was using parallax, that Italian astronomer Giovanni Domenico Cassini was able to roughly calculate the distance to Mars in 1672. His calculation was a little bit off though, because instead of taking two measurements 6 months apart, he sent his colleague to Cayenne, French Guiana (on the northern coast of South America) to make observations while he stayed in Paris. Then Cassini could make the same parallax calculation using the known distance between the two observation points (~4400 miles) instead of the distance from the Sun to the Earth. This single direct measurement of the distance to Mars, which is now easily calculated and heavily used by missions such as Curiosity, actually allowed for the calculation of the distances to all the planets. Since geometry and Kepler’s Laws governed the basic ratios the Sun-planet distances, you only needed to measure one Earth-planet distance to be able to easily calculate them all. This major contribution and several others in planetary science (including the discovery of four of Saturn’s moons and joint discovery of Jupiter’s Great Red Spot) prompted NASA to name the Saturn-bound spacecraft mission after the him. "When the Moon is in the Seventh House..."